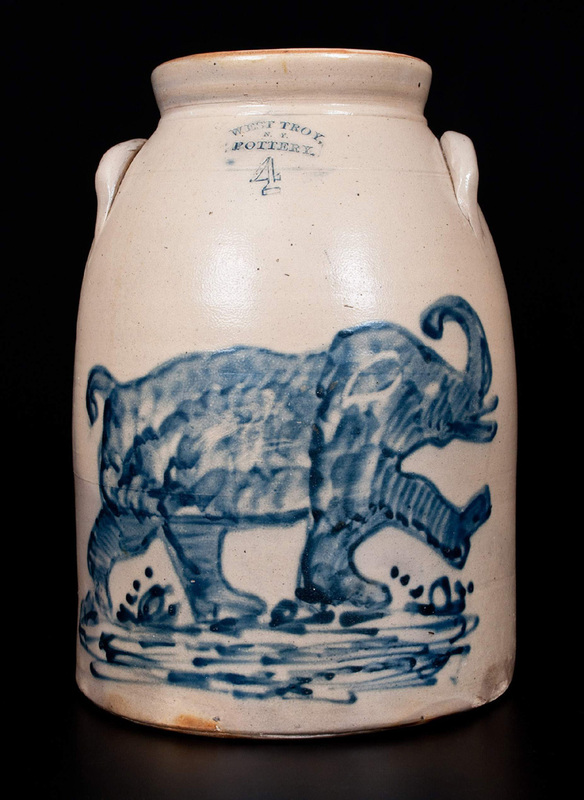 This rare 4-gallon stoneware jar decorated with a large cobalt stampeding elephant, stamped “West Troy/N.Y./Pottery,” circa 1880, was the sale’s top lot. It was purchased for $166,750 by well-known New York state collector Adam Weitsman bidding on the phone and will be included in his forthcoming book on his collection in September. Likely inspired by the popularity of circuses in America in the mid- to late Nineteenth Century — and West Troy had its share — the elephant depicted here is whimsically given boot-like feet, his trunk raised high and his proportions truly jumbo on the face of the jar — 11 inches long by 9 inches tall. The piece was fresh to the market, having recently been found in New England. 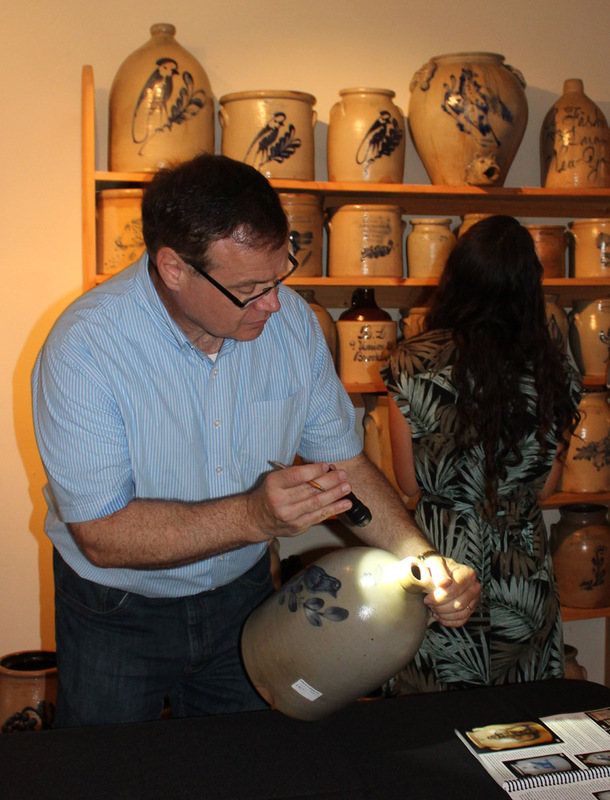 While the elephant jar was essentially baked into Weitsman’s shopping list, another purchase by the collector was a rare 4-gallon stoneware jug with profuse cobalt flowering urn decoration. Weitsman paid $43,200 for the prime example of stoneware produced at the Newport, Penn., pottery of Michael and Theophilus Miller, circa 1870. The exuberantly brushed floral spray virtually covers the front of the 15½-inch-high jug, extending from its shoulder to the base. Weitsman said that while he remains devoted to New York state stoneware, he is also trying to buy great examples of other potteries. They call him “Dr Crock” on eBay. Duane Watson, Ashland, Ohio, shown here examining a piece of stoneware being offered in the sale, has collected for more than 50 years and said he is by volume the largest dealer of stoneware on the online platform. Purchased at a yard sale for $1.50 by a New Jersey woman, this rare alkaline-glazed stoneware face jug with Edgefield, S.C. origin, circa 1860, soared from a $10,000 start to reach a world auction record for that form at $92,000. Despite its diminutive size at 5 inches tall, the jug was impressive, especially its expressive kaolin eyes and teeth. The eyes rattle freely within their sockets, thanks to the maker’s resist technique that left them unglazed during the firing. Another stoneware face jug offered in the sale was a rare harvest jug attributed to John Dollings at the Stine Pottery, White Cottage, Ohio, in the 1870s. 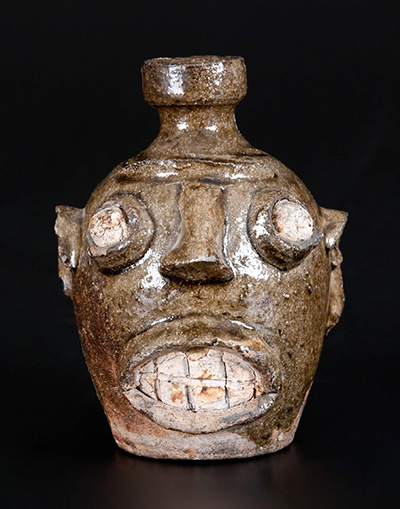 The wheel-thrown jug featuring an applied and sculpted African American man’s head with open mouth and coleslaw mustache, eyebrows, sideburns and hair sold in the room for $20,700. Also “a great, folky piece,” according to Zipp, a rare large redware African American preacher bank was pushed by fierce bidding from a $6/8,000 estimate to $12,650. With a cold-painted surface and likely originating in the South or Mid-Atlantic, the circa 1840 bank by an unknown maker was a striking example of ceramic folk sculpture. Zipp singled out the Americana qualities of another piece that also made $92,000 across the block. “It’s the folky look that people are seeking out,” he said, as a rare 5-gallon cooler with large incised fish decoration was sought out and hooked by a determined phone bidder. Made circa 1825–34, inscribed “Brandy” and stamped “Tyler & Dillon/Albany, NY,” the piece was discovered by the consignor’s family in an attic in New York state during the 1950s and sold far above its $20/30,000 estimate. The 8½-inch-long fish presents a fierce attitude, with bared teeth and tongue, sail-shaped dorsal fin, scales and long, upswept tail. The catalog notes that Moses Tyler, an Albany potter, is known for a similar cooler in the collection of the Albany Institute of Art and for one inscribed “H-Gin” and decorated with a beehive in the collection of the Smithsonian Museum of American History, Washington, D.C.
“The only example known,” observed auctioneer Tony Zipp as this exuberantly sgraffito-decorated redware plate crossed the block. Illustrated with a flowering urn decoration, dated 1803 and stamped on the back “A.U.” for Andrew Uhler, Montgomery, Penn., the plate was fresh to the market and realized $46,000 from the phone. 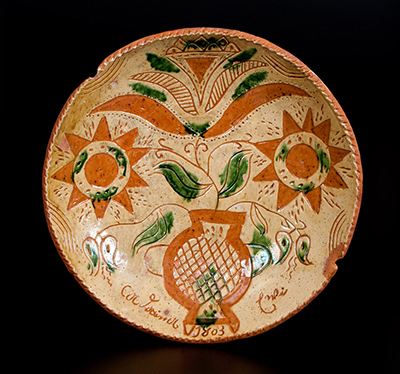 Redware in the sale was led by a rare and exuberantly sgraffito-decorated redware plate illustrated with a flowering urn decoration. “The only example known,” observed auctioneer Zipp, crossed the block to a phone bidder at $46,000, more than triple its high estimate. Dated 1803 and stamped on the back “A.U.” for Andrew Uhler, Montgomery, Penn., the plate was fresh to the market. A phone bidder claimed a Virginia redware cooler from the Shenandoah Valley for $17,250. The rare 6-gallon keg-form cooler made in the late Nineteenth Century featured a striking multiglazed surface and was stamped “J. Eberly & Co./Strasburg, Va.” Redware pottery attributed to S. Bell & Sons, Strasburg, Va., is always highly sought-after, and such was the case with a pitcher and bowl set, circa 1890, miraculously intact and in excellent condition, featuring a multiglazed surface decorated with streaks of green, copper and reddish brown manganese, as well as applied “fiddlehead” scrollwork. It sold to a phone bidder for $18,400. Like the face jug, a 5-gallon double-handled jug featuring an elaborate two-color slip floral decoration, was one of the stellar Edgefield, S.C., pieces offered in the sale. It, too, utilized kaolin, but in this case combined it with iron-oxide slip against a mottled green background to create a tactile, raised floral decoration that begs to be stroked. Fetching $40,250, the jug was attributed to Collin Rhodes, Shaw’s Creek, circa 1845. Another Edgefield piece was won by the discerning Toussaints, who bid $8,050 for a 7-gallon alkaline-glazed stoneware jar attributed to an enslaved maker known as Dave, who potted for Lewis Miles Stony Bluff Manufactory, Edgefield, S.C. The front includes a stylized “F,” followed by the date, and the reverse is incised “Lm” for Dave’s owner Lewis Miles. The business is a family affair, from left, Tony and Barbara Zipp and their sons Brandt, Luke and Mark outside the awesome venue for Crocker Farm sales, the 1841 Gorsuch Barn featuring original beams and flooring. A lot of the stoneware on offer is big, beefy and masculine with sturdy bases, broad shoulders and thick, manly handles. Not so lot 190, a diminutive stoneware presentation jar with two-sided incised floral decoration. Exhibiting a decidedly feminine sensibility, the quart-sized ovoid jar with open loop handles was inscribed “Rachel Van Riper/November 10th, 1800,” one week before, according to records, the jar’s recipient Rachel van Riper (1773–1853) of Belleville, N.J., married John Williams. With Manhattan origins, the jar, which brought $26,450, had previously been in the collection of Gary and Diana Stradling, who purchased it at Christie’s in New York in 1982 for the then-impressive sum of $5,000. 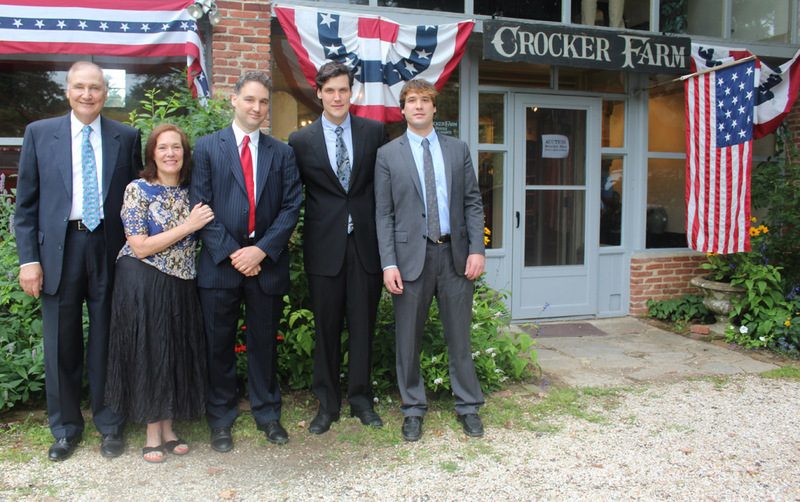 Overall, the sale was Crocker Farm’s highest grossing to date, with more than $1.2 million worth of American stoneware and redware sold. Prices reported include the buyer’s premium. The firm’s next auction will be conducted Saturday, October 24, and it is now accepting consignments. For information, 410-472-2016 or www.crockerfarm.com.